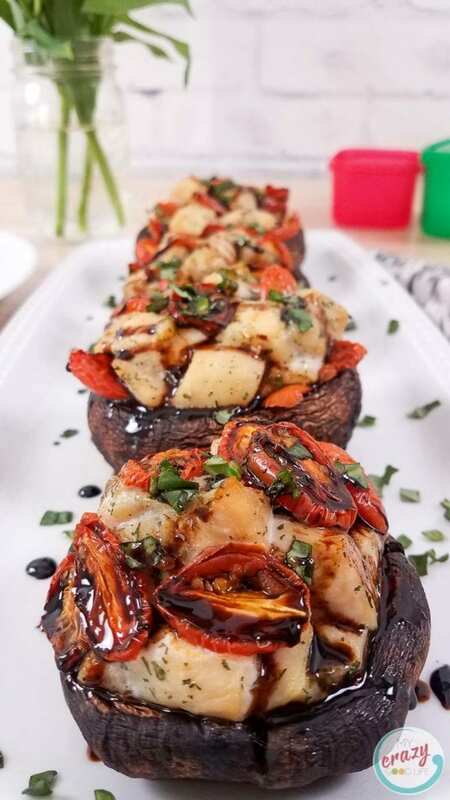 These Caprese Chicken Stuffed Portobello Mushrooms are a delicious lunch or dinner! 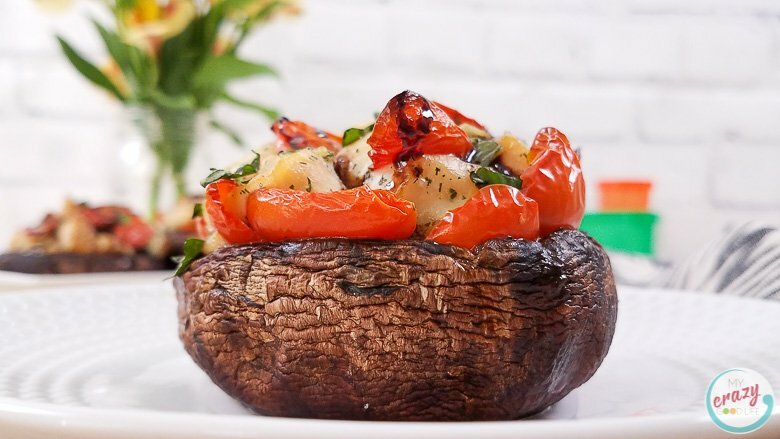 A large portobello mushroom topped with a caprese chicken inspired mixture can be easily baked for a healthy dinner. I love how hearty and versatile portobello mushrooms are! Finding new and healthy ways to enjoy my favorite flavors is a must. Boredom usually leads to unhealthy eating so I try and keep things fresh and fun in the kitchen! It also helps that mixing things up keeps my family on their toes and trying new things. 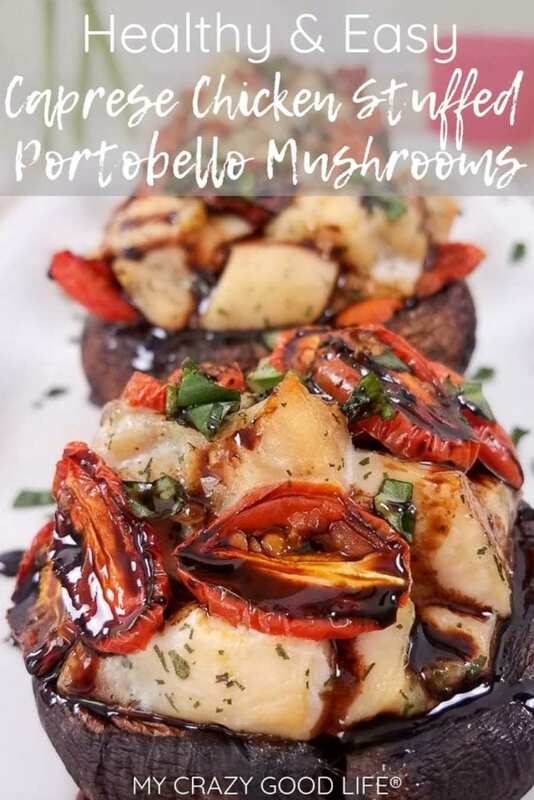 If you are not a mushroom fan you might want to give these caprese chicken stuffed portobello mushrooms a try before skipping them on the basis of ‘ew, mushrooms!’ The combination of flavors and textures work really well together. Use a damp paper towel or a soft mushroom brush to clean the surface and remove any dirt or debris. You can also rinse with cool water and towel dry. These stuffed portobello mushrooms are baked, but you can cook these mushrooms in a variety of ways. See the directions above for cleaning portobello mushrooms and then prepare them in any way you like! I like mushrooms cooked and raw. They are delicious in salad and also go great in this risotto recipe! Why doesn’t this chicken caprese recipe have cheese? Easy! I don’t like cheese. 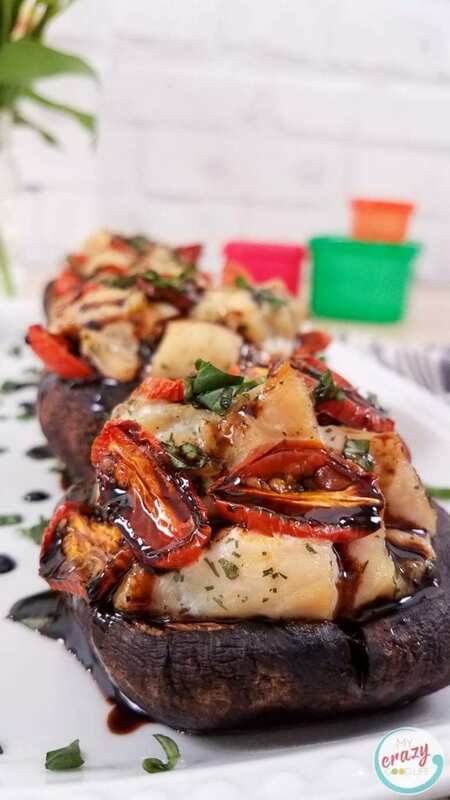 BUT that doesn’t mean you can’t enjoy these caprese chicken stuffed portobello mushrooms with some cheese. Feel free to add some to the recipe if you want it and your healthy lifestyle guidelines allow for it! I don’t include any cheese in the Weight Watchers Freestyle points or the 21 Day Fix / Portion Fix counts for this recipe, so please keep this in mind. 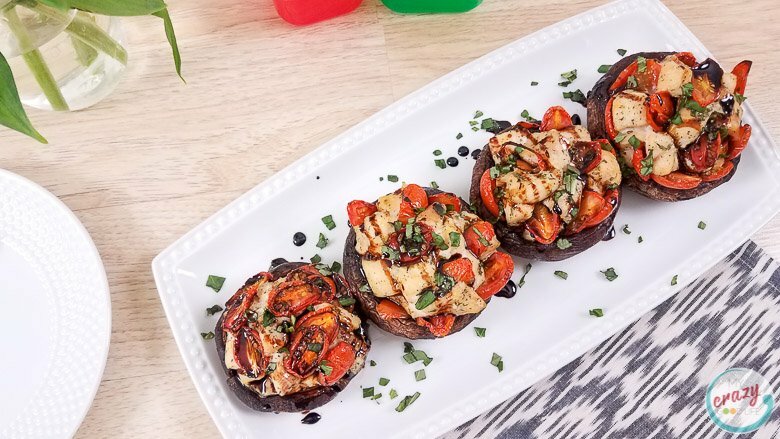 What is the 21 Day Fix | Portion Fix breakdown for these stuffed portobello mushrooms? 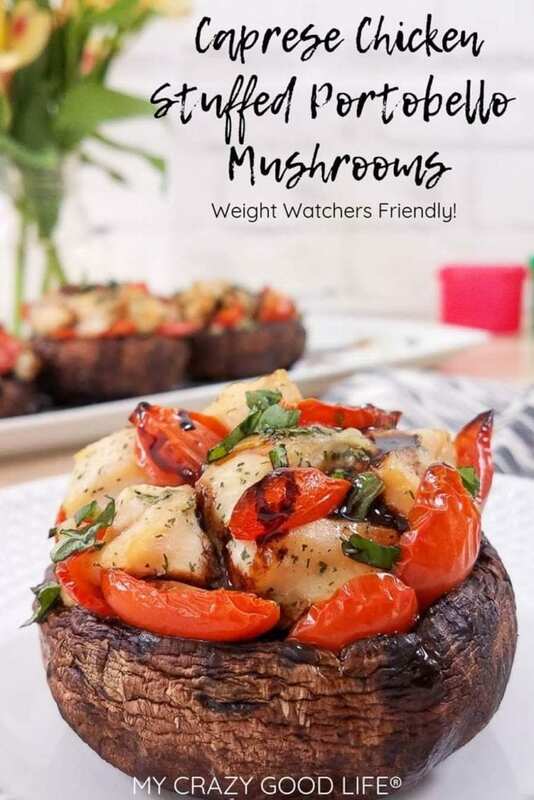 Do you have Weight Watchers Freestyle Smart Points info for these chicken caprese mushrooms? I sure do! These Weight Watchers stuffed portobello mushrooms are very low in points. The recipe makes 4 serving. Each mushroom is just 2 Freestyle Smart Points. That’s a great recipe for lunch or dinners that you can enjoy with a per serving point value of less than 5! Can I have these caprese chicken stuffed mushrooms on 2B Mindset? Absolutely! 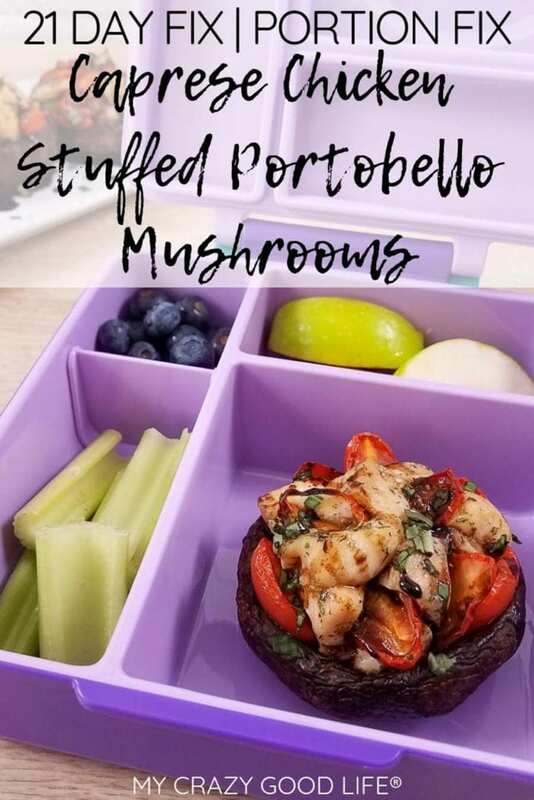 There are no FFCs in these delicious stuffed mushrooms so you can enjoy them on 2B Mindset for any meal! I don’t think I’ll be serving them up for breakfast any time soon but as a lunch or dinner option you can’t go wrong. You could even add these alongside your favorite whole wheat pasta at lunchtime. 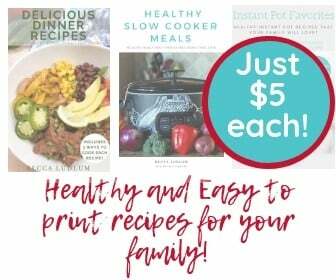 Do you have any other healthy recipes I can try? 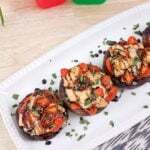 Are these caprese chicken stuffed portobello mushrooms keto friendly? Each one of these mushrooms has about 10g of carbohydrates which means this is an acceptable keto recipe! 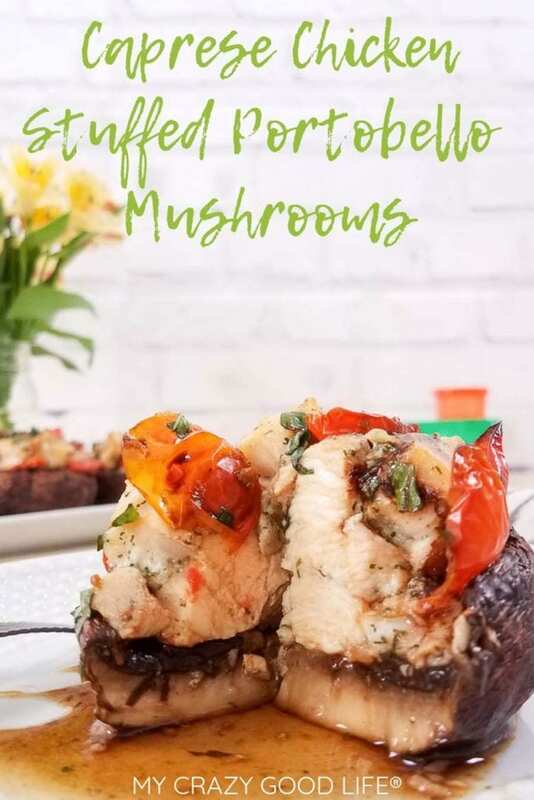 There’s nothing starchy in these stuffed mushrooms so this delicious caprese chicken stuffed portobello mushrooms recipe is low carb! For another low carb twist you can also add some cheese to these stuffed mushrooms as well. In a bowl, mix together the chicken, 1 tsp oil, garlic salt, dill, and parsley. Next, place the mushrooms in a baking pan and lightly cover the mushrooms with the remaining teaspoon of oil. Sprinkle with a pinch of salt on both sides. 4) Fill each mushroom with the seasoned chicken. Add the tomato slices to the mushrooms. Be sure to slide some pieces in between the chicken so they stick. Bake the mushrooms uncovered for 20-25 minutes in the oven. During the last 5 minutes of baking add the balsamic vinegar and honey to a sauce pan and heat on high heat while mixing. Let the vinegar come to a simmer. Continue to stir the vinegar until it reduces and thickens to a glaze. Remove the mushrooms from the oven. Sprinkle with the basil and drizzle the balsamic glaze over before serving. Note: If the glaze cools and thickens too much in the sauce pan you can save it by reheating and adding an additional 1-2 tsp of vinegar to the glaze. This will loosen it so that you can drizzle the glaze. I loved the taste of those mushrooms, so tender and juicy! Chicken added extra flavor to it. This recipe is so meaty and satisfying and fit my low-carb diet plan PERFECTLY! Thank you! Does the chicken cook in the oven or do you cook the chicken first ? The chicken cooks in the oven!